The following is an excerpt from the Comprehensive Plan. The entire plan is available for review at the Township Office. The Comprehensive Plan involves an inventory of the Township’s existing conditions and characteristics, an analysis of its natural and man-made features, a vision for conservation and future growth, and recommendations for achieving this vision. Its primary purpose is to establish the policies that will guide land use decisions over the next 20 years. It is intended to promote a coordinated development pattern that meets the municipality’s long-term planning goals and is compatible with regional planning efforts. In order to achieve sound and effective policy recommendations, the various social, economic, cultural, historical and physical factors that impact land use are analyzed. An examination of local and regional demographics is useful in identifying current social patterns and subsequent development trends, and provides insight into future growth potential. Extensive mapping of natural and man-made landscapes provides a record of existing features and, when analyzed in conjunction with demographic data, enables an assessment of future needs in terms of housing, infrastructure, community facilities, and conservation of natural resources. Analysis of the data in a spatial context assists in determining the optimal locations for such features. In particular, it yields a basis from which to delineate areas that are suitable for development and areas that are not suitable for development, as well as areas that warrant special conservation efforts. Charlestown Township maintains a fragile position within the Philadelphia metropolitan area. Its scenic beauty and accessibility to major regional centers such as the Great Valley Corporate Center, Exton, King of Prussia, and Valley Forge, make it a very desirable place to live. Ever increasing population and development in the region and in surrounding communities continue to exert enormous pressure on Charlestown. Not only is Charlestown under immense pressure to accommodate more development, it is also impacted by the development taking place beyond its borders. This is most evident where external development has generated an increase in traffic, much of which passes through Charlestown creating severe traffic congestion on the Township’s road system during peak hours. In recognition of its situation, Charlestown Township has undertaken the task of producing this Comprehensive Plan in order to address conservation and growth management in a proactive manner. As an update to the 1976 plan, this Comprehensive Plan reflects current conditions in the Township and the region, as well as current thought and science in regard to land planning and growth management. It also strives to be consistent with the principles of the Chester County Landscapes plan and Pennsylvania’s Growing Smarter initiative. In general, the Plan seeks to accommodate an appropriate level of development in the appropriate areas, while preserving the Township’s natural features, rural character, and heritage. In doing so, it intends to maintain diversity among the Township’s landscape in order to advance the County’s “livable landscapes” concept. Although much was accomplished with the 1976 Comprehensive Plan, through its implementation, additional strategies and policies needed to be devised. 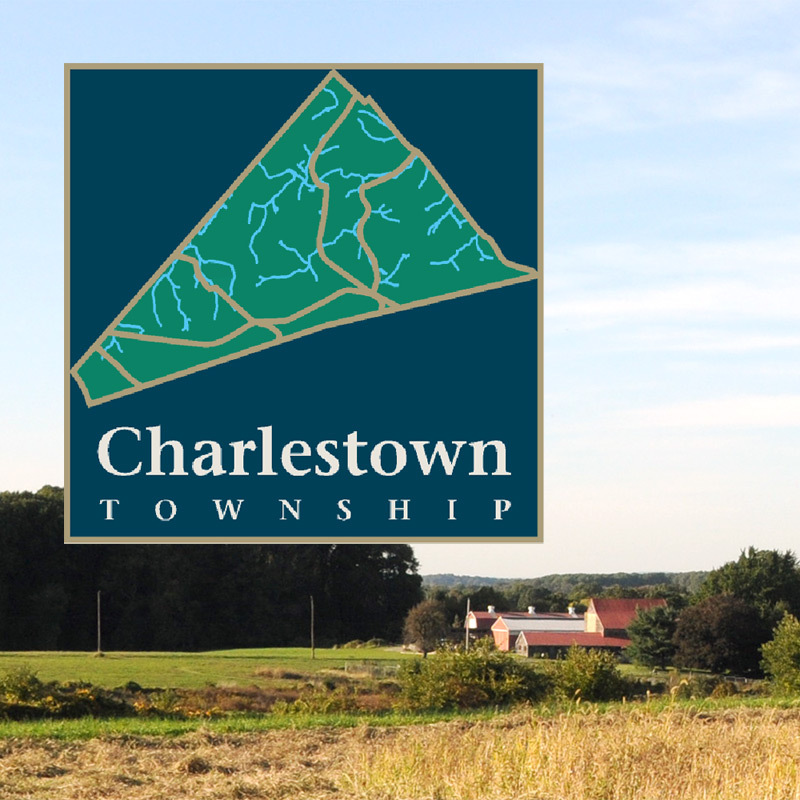 In 1979, Charlestown Township adopted a major overhaul to the Zoning Ordinance with an emphasis on the protection of environmentally sensitive areas. In 1982, a new Subdivision & Land Development Ordinance was adopted. It introduced an Environmental Impact Assessment and Mitigation procedure. In 1999 and 2000, the Township enacted Zoning Ordinance Amendments pertaining to an Open Space Option. Additional tools and techniques for conservation and growth management are presented in this Plan. The legal framework for the Comprehensive Plan is established in Article III of the Pennsylvania Municipalities Planning Code (MPC), Act 247 of 1968, as amended. The MPC is the enabling legislation that empowers municipalities to plan and govern development (either individually or jointly) through the use of various planning tools including, among others, zoning ordinances, subdivision and land development ordinances, the official map, and the Comprehensive Plan. It also provides guidelines for producing and implementing these plans and regulations. It is important to note, however, that although governed by the MPC, the Comprehensive Plan is not a legal document. The Ordinances that follow from this Plan will provide the legal basis for regulating land use (see “Implementation” below). A statement indicating the compatibility of the municipality’s existing and proposed development to adjacent municipalities and to the objectives and plans of the county Comprehensive Plan. The Comprehensive Plan effort was lead by the Charlestown Township Planning Commission, the Township Engineer, and several members of the Board of Supervisors. This group met with the Township’s planning consultant on a monthly basis beginning with a Visioning Process, in which municipal planning goals and a future vision were established. This was followed by an extensive mapping effort focused on existing land use, environmental features, community facilities, transportation systems, and public utilities. Map production was accompanied by several meetings dedicated to the review and analysis of the data, the discussion of local and regional planning issues, and various land planning techniques. Eventually, all pertinent environmental and land use data were combined to produce the Development Constraints map (Map 4) depicting areas suitable for development and areas unsuitable for development. A Work Session was then held in November 2000 in which the Development Constraints map was presented along with a build-out analysis of future residential land use as it could take form under current zoning. Township officials and commissions were charged with the task of developing an alternative to this scheme. The result was the delineation of lands deserving of protection, and further direction in terms of locating future development. When considered in conjunction with community facilities, transportation, and public utilities systems, the data yielded a clear picture of those areas that are most appropriate for development. Subsequent discussions were held in order to reach consensus on these areas, and associated land use policies were formulated. The final result of this analysis is depicted in Map 5, A Plan for Future Land Use. Public participation is an extremely important component in the development of this Comprehensive Plan. Regular meetings, open to the public, were held on the second and fourth Tuesdays of every month over an 18-month period. To obtain further input from Township residents, Special advertised Public Meetings of the Planning Commission were held on May 22, 2001 and on September 10, 2001, prior to the Public Hearing by the Board of Supervisors (Appendix D). Because the Comprehensive Plan is not a legal document, its strategies and recommendations must be carried out through other means. Plan implementation is primarily accomplished through amendments to the Zoning Ordinance and the Subdivision and Land Development Ordinance. Because the most dramatic changes to the Township occur through the land development process, which is governed by these two Ordinances, they must be consistent with the policies established by the Comprehensive Plan. Furthermore, applicants for Subdivision, Land Development, Conditional Use, Special Exception, and/or Variance must be cognizant of the provisions of the Comprehensive Plan, and should indicate on their plans and submissions how they have incorporated the findings and recommendations of the Comprehensive Plan into their development proposals. Implementation strategies can also be carried out through special projects and planning initiatives conducted in cooperation with other Township boards, the County, regional authorities, and public and private agencies such as the various land trusts and conservancies. The Township should also establish an outreach program to open up communications with land owners in matters related to land planning techniques and land preservation incentives. Such an effort should be lead by the Township Open Space Commission. Prior to adoption, the Chester County Planning Commission reviewed the Plan on two occasions, including the Vision Partnership Program Review and the Act 247 Review. This Plan was considered for adoption at a Public Hearing held by the Board of Supervisors on September 18, 2001. The Public Hearing was conducted after the Planning Commission recommended that the Board of Supervisors adopt the Plan. The formal adoption of the Plan took place on December 3, 2001.